McRaptor Gaming: What is a Dark Souls "Hitless" run?? The Dark Souls "hitless" or "no hit" run was created by the beautiful mind of Twitch streamer and UK legend The_Happy_Hob. He grew tired of "regular" challenge runs in Dark Souls like deathless, no leveling, restricted weapons, etc. and came up with the grandest challenge run of all: beating the game of Dark Souls without ever being damaged by an enemy or boss. He accomplished this amazing feat live on February 14, 2016. What came after this was a FLURRY of new Soulsborne hitless challenges and runners. Ok, cool stuff, but what is a hitless run? One of the ways I like to explain the "hitless" challenge run is completing the game in a "flawless" manner. Essentially, you play the game from start to finish without being damaged by any bosses or enemies. Never screw up---don't die, get staggered, take damage from enemies. At its core, there's nothing more to know. ...but of course there are a few rules and exceptions. First and most important, there's no glitches, "skips", or quit-outs allowed, which really differentiates the run from other challenging PVE runs like speedrunning. In speedruns, players often find creative ways to skip through areas/bosses using unintended glitches in the game. Those aren't allowed in hitless runs because they lessen the challenge. ALSO, hitless or no hits taken runs are not "NO DAMAGE" runs. The games of Dark Souls and Bloodborne have fall damage mechanics---your character takes damage from even small drops in height. This isn't a "hit" in a hitless run, because the damage source wasn't an enemy. Same goes for most environmental effects, like poison swamps, lava, etc. 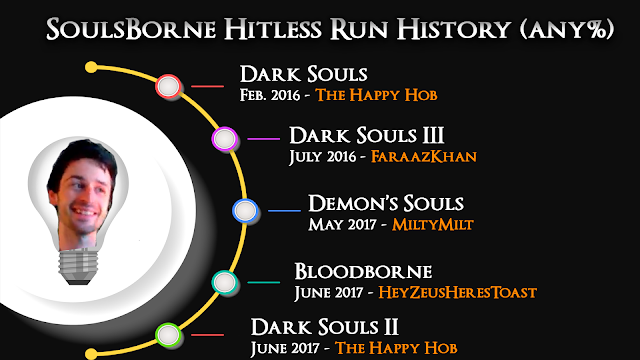 It got to the point in 2018 where literally DOZENS of runners had completed hitless runs in various Soulsborne games. There were general ideas of which runners were the "best" in their game, but no way to prove it. That was until the first major Dark Souls 3 Hitless Tournament launched in September 2018. Eight runners went head-to-head in single elimination matches to prove who was the best. And since then, we've had eight total hitless tournaments and we're not stopping anytime soon!